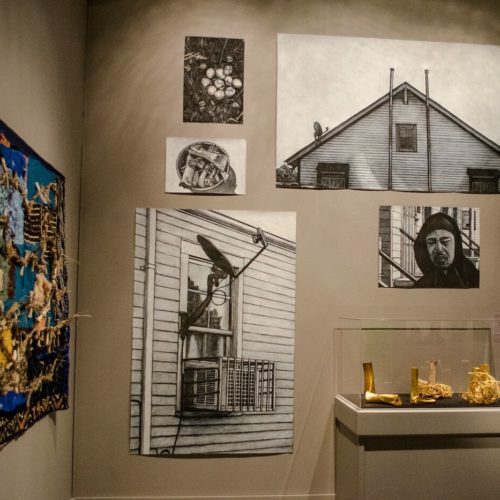 “Changing Course: Reflections on New Orleans Histories,” New Orleans Museum of Art’s tricentennial exhibition, features seven contemporary art projects, all focusing on the city’s forgotten or marginalized histories. 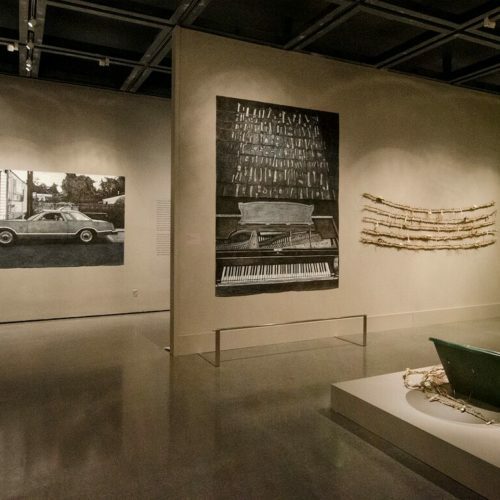 Running through Sept. 16, the show juxtaposes memories of the past with visions for the future, encouraging observers to consider how history can spur evolution and change. New Orleanians observe evidence of history on a daily basis, but how often do we reflect on its current impact? NOMA artists, Katrina Andry, Lesley Dill, Skylar Fein, L. Kasimu Harris, The Everyday Projects, and The Propeller Group identify as “defining moments” the fire at the Upstairs Lounge, youth’s search for African-American history in public education, Vietnamese contribution to culture, and the mysterious visions of folk artist Sister Gertrude Morgan. Through the metaphors of roots, sweetgrass and bones, Willie Birch explicitly captures the historical experience of African Americans. As a boy, Birch visited the Isaac Delgado Museum (renamed New Orleans Art Museum), but felt estranged by its collection of white American and European artists. Until 1958, when City Park desegregated, Willie was forbidden to stray from the museum. Over his lifetime, Birch has gained widespread recognition, and his work is among the collections of the Metropolitan Museum of Art, Whitney Museum of Art, Civil Rights Museum in Memphis and others. Now, he is returning to his roots to rediscover his own genealogy. A constellation of the artist’s signature charcoal and acrylic images cover two walls. He photographed and drew neighbors posed before off-kilter doorways and window-frames. The local aesthetics include a pair of old sneakers, chain-link fences, twisted power-lines, and vintage motor vehicles. For a neighborhood at imminent risk of gentrification, these elements connote authenticity. “The portraits are the silent people,” Birch explained. “They are very bright, but they have no voice.” By picturing them full-face, he forces viewers to wonder who they really are. His renderings reveal their dignity; Mary’s beauty radiates, and she is majestic, Birch said. A Vietnam veteran descended from one of the oldest Creole families, Junior’s facial expression exudes pride. “If my work survives, it will be a record of a time and place to be used as a tool for understanding who we were as human beings, particularly in New Orleans,” Birch said. He adopted the approach taken by the masters Vincent Van Gogh and Pieter Bruegel who painted ordinary people. They broke precedent in their eras, portraying peasants and barmaids. 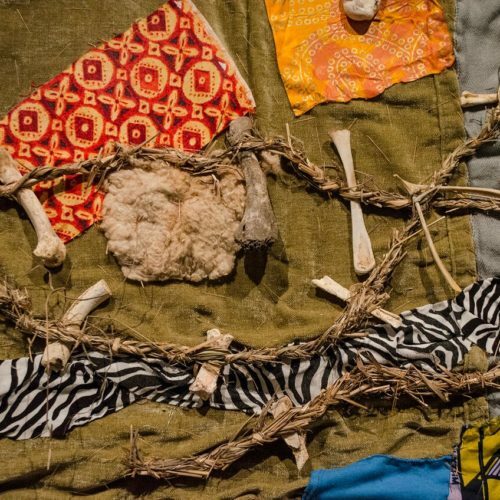 The exhibition’s primary pieces are constructed of organic materials, native grasses and bones, found on the property where Birch is creating a community garden. Woven grasses form long chains, representing shackles but also generational lineages. At the center of the room, long, winding strands of grass appear to be shoveled into a wheel barrow. 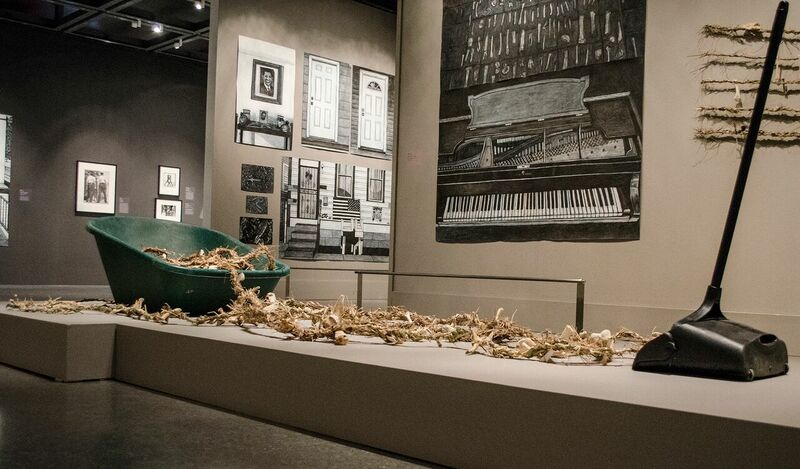 Birch calls this, “gathering the memories.” Against one wall, braided grasses form a musical staff and a drawing of a grand piano with keys fashioned from bones reference African Americans’ relationship to music. “When my family gathers, we represent seven generations of Louisiana history. I know the story of these people and how they impacted history. For instance, I’m from Bertrandville (a town south of New Orleans in Plaquemines Parish). A plaque in the new church there commemorates the first African-American church in the area, which was built in 1860. These people found a way to build their own church on plantation property even before emancipation,” Birch was quoted in the book, Artist Spaces. “I’m a visual storyteller,” Birch stated. The exhibition’s piece de resistance is a 24.5-ft. tapestry that is beautiful, powerful and tragic. Reading right to left, it tells the story of the unsuccessful 1811 slave revolt, involving up to 500 slaves. It began in the German Coast and was finally stopped near Kenner by federal troops. Birch creates the narrative using parallel ropes made of grasses and studded with bones, recalling streams of slaves deserting and setting fire to plantations. Swatches of traditional African textiles and contemporary fabrics appear like plots of cultivated farmland. The blue waters of the bayou line the tapestry’s lower edge. NOMA set aside a room to contemplate these images, overlooked by Birch’s masterpiece, “Waiting for a Serious Conversation on the History of the South.” The painting depicts a porch on Esplanade Avenue with two empty wooden chairs waiting, side by side, ready for dialogue about New Orleans’ racial past and its future. Exhibition-related programs will include curator-and-artist-led noontime talks featuring Willie Birch, Katrina Andry, Kasimu Harris, and Skylar Fein, gallery tours, artist perspectives, a lecture by Leslie Dill, an #EverydayNewOrleans round table, and Picturing Us, a five-documentary film series exploring the people and places that make New Orleans home. On Aug. 3, four of Birch’s neighbors will sit on a panel for a serious conversation.